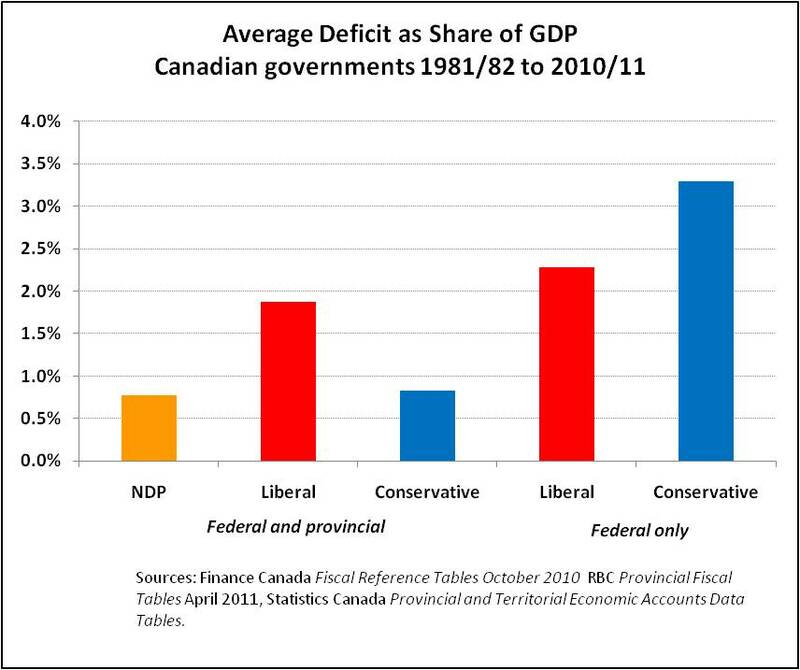 Yesterday, I posted this article showing how NDP governments have been the most effective with respect to balancing budgets over the last 40 years, relying heavily on this article from the Progressive Economic Forum (PEF). Unfortunately, another article on the PEF, inflates the fears of neocons and voters everywhere that all people on the left seem to want to do is create ballooning budget deficits. Ugh. This is SOOOO WRONG. 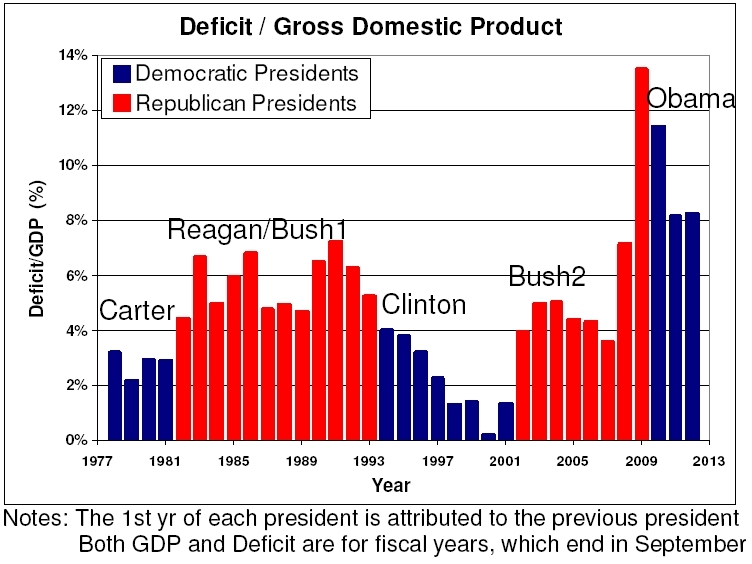 Wanting a balanced budget is NOT a neocon promise. I will repeat and paraphrase: a balanced budget is not a concept owned by the Conservatives. It’s a lie they spread, yes, but it has CONSISTENTLY been something they are incapable of delivering. Look at Canada, the US and pretty much any other country around the world. Budgets explode into deficit when Cons are in control and are restrained when more progressive parties are driving the bus. The facts show us time and again that those right of centre are completely inept when it comes to maintaining fiscal stability. Doug Saunders of the Globe and Mail agrees with these facts. 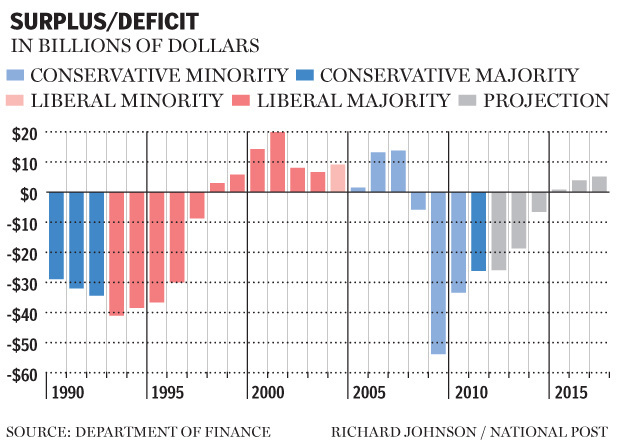 Lefties should feel proud of their ability to conquer and quell budget deficits. Why then, are we lead to believe that Conservatives are the only ones who are entitled to promising such a thing? I consider myself a ‘leftie’. I also consider myself to be fiscally responsible. The two traits do NOT run in conflict with each other. I will repeat that I simply believe in different options. One way to appreciate why ‘lefties’ don’t want deficits: because we’re mortgaging our financial independence to capitalist entities. The less we borrow, the less we enrich the 1%. If we borrow, we should borrow as a financial tool to invest in long-term projects, much like corporations treat debt vs equity. A current account budget, which operates on an annual basis and which (by legislation) can never go into deficit (not a ‘rightie’ perspective, but more one of ‘prudent person / keeping your house in order’ perspective). This might be called the ‘grocery’ budget. 2. A capital account budget that is financed by borrowing and which is repaid over the life-time of those capital investments. For example, borrowing $100 billion to finance infrastructure projects that are funded by fares, tolls and other levies or possibly even not funded at all with a reminder that some public projects result in vastly expanded efficiencies (ie. more people working or getting to work on time or more tourists to a national park, etc etc etc). This is like the ‘mortgage’ budget. This latter budget concept is something unique to financial planners and probably finance ministers, but it’s something we have to embrace if we’re to emerge from the bickering about financial largesse vs ruin as a ‘left-vs-right’ concept. Funding long-term projects cannot happen when we look at our books on a weekly or quarterly basis. We have to account for different components, their payouts and their impact on society at large. A great example is a National Daycare Program. They do not represent financial stability for Canada. Security is an obsession of the Conservatives because it is racism thinly veiled as protection of all things, white, old and male in Canada. If you’re left-of-centre or even moderate in politics, you are doing the NDP a great disservice by spreading the myth and confirming the worst fears of neocons that all lefties want to create budget deficits. Paying down debt is the first step towards financial independence from these corporate lenders and it’s time we had an NDP leader – ie. Mulcair – that wants to invest in Canada’s people rather than interest. Why would the left want to borrow more money from the world’s money lenders and financial elite? A balanced budget is easy when you consider the options in front of you. Ending Harper boondoggles like the Economic Action Plan and investing in proper infrastructure, eliminating tax credits for the 1%, curbing military spending, etc and then investing in long-term programs like National Day Care are all possible and just a few OPTIONS a leader has when creating a budget. I know this has been a long rant, but remember that everyone has to balance their own books, regardless of political position, so why should we have different expectations for our political leaders and their finance ministers? Sadly, there’s no opportunity to blame Stevie ‘I can’t manage the economy’ Harper for the economic ills in China or the slide in oil. (Even though I would love to blame him …). BUT … we can blame him for a substantial breach in political etiquette. Stephen Harper engaged in a private conversation with the Bank of Canada Governor. No one knows what was discussed in this call. There were no other staffers on the call (to our knowledge). There was no script of the call taken (again, to our knowledge). We don’t know, maybe, if Stephen Harper instructed the BoC Governor to modify monetary policy so it would help steer the Canadian economy away from recession status. We also know that Poloz refuses to use the word ‘recession’ even though we are in one. Was he being told to continue to avoid that dreaded word, lest he wind up in the salt mines of Harper’s political naysayers? It’s going to open questions. Now, I’m not a lawyer or expert with public policy, but Stephen Harper should act quickly to disclose what was discussed before the Bank take any action because if the Bank does take action under his guidance, this could compound into a VERY serious issue that all Canadians should be concerned about. Realistically, there should be no interference with monetary policy, nor should monetary policy be used for political gain, as Jim Stanford with the Progressive Economics Forum suggests. As he is technically no longer the Prime Minister of Canada (Parliament is dissolved and the writ has been dropped), the candidate for Prime Minister has obtained access that all other candidates for Prime Minister should have. Understandably, there should still be discussions, but there should also be RECORDS of these discussions. In the past, when other political candidates and leaders have suggested discussions with the Bank of Canada Governor, they were pressured to issue an apology. Stephen Harper’s act of political interference with Bank of Canada policy could very well become the next political scandal. So … should Stephen Harper issue an apology, like candidates and politicians before him? If so, when will this happen? He won’t. Because he won’t. If that doesn’t make sense to you, you don’t understand why Stephen Harper and his cabal has to be voted out of office in October. Let’s talk about the lies that Stephen Harper tells every time he opens his mouth. Failure to do would so translate to even more political positioning and erosion of important separations of institutions from the ever-growing power grab from the PMO. Stephen Harper has promised to get tough on drug crime in Canada. He will put an end to the Constitutionally upheld right to drug treatment centres in Vancouver. He will make everyone who tokes on a bong or joint a criminal. He will vastly expand the ridiculously expensive incarceration infrastructure – all at the expense of average Canadians – just to be the ‘tough on drugs’ guy. Honestly, I don’t know what he’s smoking, but he’s insanely out of step with the rest of Canada. Prescription drugs account for just as many deaths (if not more) in Canada than ‘illegal’ drugs. And yes, I’m making that up because Statistics Canada no longer tracks these numbers and gives sociologists and lawmakers something to work with. The harm associated with psychoactive prescription drugs has emerged as one of the leading public health and safety concerns across North America. Canada is now the second-largest per capita consumer of prescription opioids (exceeded only by the United States), according to the International Narcotics Control Board (2013). Globally, North America consumes approximately 80% of the world’s opioids. 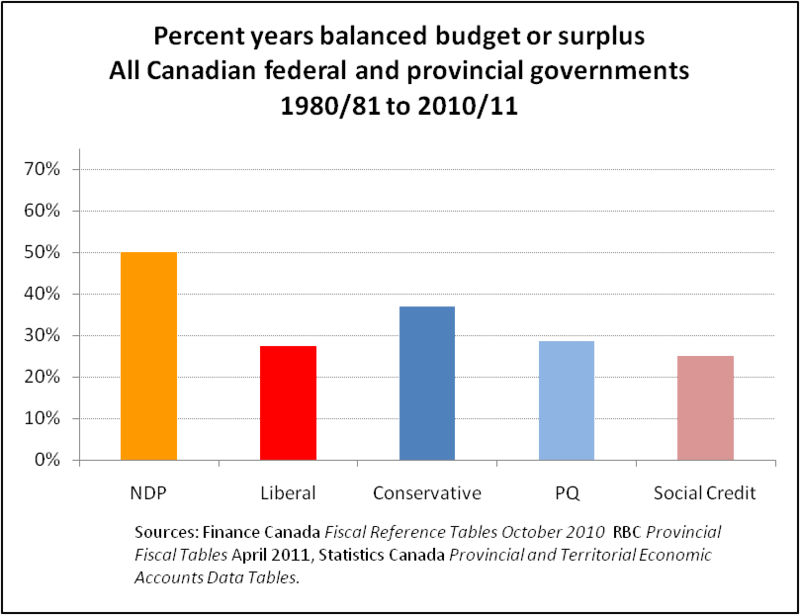 Deaths related to prescription opioid use doubled in just over 10 years in Ontario, from 13.7 deaths per million people in 1991 to 27.2 deaths per million people in 2004 (Dhalla, et al., 2009). Some First Nations in Canada have declared a community crisis owing to the prevalence of the harms associated with prescription drugs (Dell, et al., 2012). Between 2005 and 2011, there was a 250% increase in the number of emergency room visits related to overdose, psychosis, etc related to prescription drugs. Problematic opioid use is the leading cause of demand for methadone clinics in Canada. Illegal use of Fentynal is one of the fastest growing markets and causes of gang violence and crime. Prescription drugs are now one of the leading causes of vehicle-related accidents and deaths. Legal substances (tobacco and alcohol) account for nearly 80% of the total cost of substance abuse (roughly $32 billion) compared to $8 billion for illegal drugs. The ‘tough of drugs’ stance is a complete smoke and mirror tactic used by the Cons to play to their base that’s probably fucked up on ‘Hillbilly Heroin’ (ie. Fentynal, Oxydodone). Stephen Harper has to get with the 20th century and understand that the drug companies that are lining his pockets are the culprits here.